This is how I imagine my Main Character Tanya to be when she's not with Nate: sprawled in her room with only her books as company, dreaming of the day she'll have her own bookstore. (Or this could also be a visual representation of myself, except my room's messier and aside from the bookshelves, there'll also be book towers around me.) Also, this took me all afternoon and my right hand hurt. For those who've read the story, did it match how you visualized Tanya, too? Anyway, the spotlight is on the BuqoYA 2: Sweet Complications [that contains my story Once Upon a Sticky Note] starting tomorrow, thanks to a blog tour organized by Dianne of Oops I Read a Book Again! The blog tour is passing by this site on May 6 (Wednesday), so check back because I will be posting excerpts from all the stories included in the bundle! To celebrate this occasion and thank everyone who have already bought a copy of our bundle [as well as those who are planning to], I put together a fun giveaway that's open worldwide! 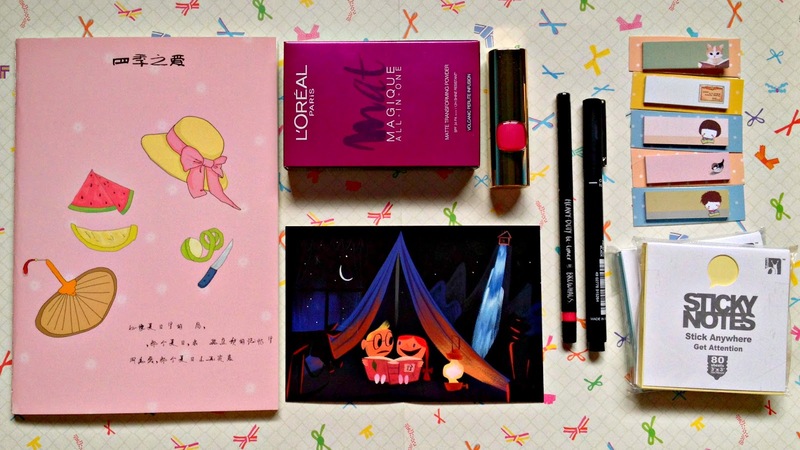 Prizes include a notebook, a L'Oreal Paris Mat Magique All-in-One Powder in Vanilla Ivory (reviewed here), a L'Oreal Paris Color Riche Lipstick in Pop Up Pink (reviewed here), Browhaus Bi-Liner in Blush, a black Uni Pin Fineliner Pen 0.05mm, a print of The Art of Pixar featuring concept art for Up in gouache by Lou Romano (that photo is so Tanya and Nate I cannot not include it), and packs of sticky notes. I might also still be able to add more prizes to this loot. We'll see. 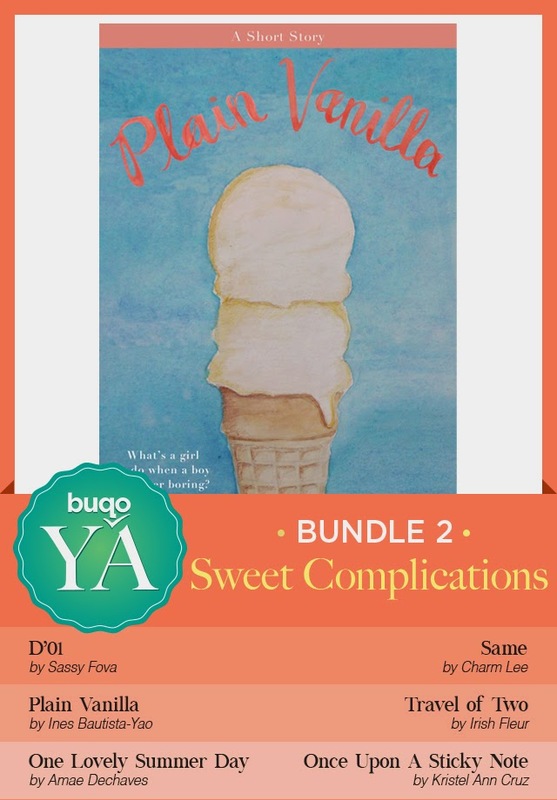 This giveaway is open to everyone worldwide so long as you have a copy of the Sweet Complications bundle, either purchased from Buqo or as an ARC for participating in the blog tour. Disqus allows images with the comments so just kindly put a watermark on your screenshot OR the link to your review of the bundle/ Once Upon a Sticky Note and you're in. (^_−)☆ You must be wondering why I have all those questions. Well, I'm currently writing the continuation to their story and I would like to know, since you read it, what you would like to see next. Is there a specific scene you liked best? A scene you would've liked to have been explored more? A scene you can foresee happening between adult Tanya and Nate? This giveaway will run until the end of the month so for those who don't have a copy yet, you're free to visit Buqo and buy our bundle! It's on a special price of only $0.99 (P45) again this week! The best thing about it is that you're getting five more stories in the bundle. That alone is a huge deal already! Aaand that's it! For questions, reactions, or just about anything, leave a comment, email, or tweet me! Thank you and good luck! i love the note because is so cute!!! I can totally relate with Nate and Tanya coz I got a guy bestfriend too and yes we tried to go to the next level but things didnt work out so we had a "gap years" before we became friends again. But not bffs anymore :( #AllisWell for us! A continuation is good, I would like to know how will they be as a couple? Will getting to the next level be complicated or not? I always thought the cover was so creative and it got our attention as well :) The written work is so relatable and I love them! What did you really think about Once Upon a Sticky Note? -Everyone can relate to. This could happened to any one of us. The simplicity and realistic of the whole story, I love it! What was your favorite scene? What scene do you think should have been explored more? -Favorite scene: Definitely the end! You nailed that 'special confession and moment!' Well done! What would you like to see on the continuation of Tanya and Nate's story? Their other friends'? Their families'? Good luck with the continuation Krissy! :) Aja! What did you really think about Once Upon a Sticky Note? -- It's cute. I'm sure at some point in our lives we all had a guy best friend whom we fell in love with, or at least got infatuated with. It made me smile because, well, I remember my teenager self going through same things like Tanya. The world was full of hues of pink. Hahah. I like the concept of sticky notes because nothing beats the old school handwritten expression of thoughts and feelings. I feel its more sincere (similar with snail mail kind of thing). In this modern age, sending a text message always does the trick. What was your favorite scene? -- It has to be Tanya's birthday, when she saw her room filled with balloons as surprise from Nate. And of course, that sticky note again. What scene do you think should have been explored more? -- I think it would be great to see more scenes with Nate in them (ie What is he thinking, how did he realize he likes Tanya, the development of his feelings, if Armi also likes Nate and then she becomes an antagonist -- you know sometimes we need a kontrabida to make our bidas realize their true feelings hahaha, etc etc). Also, the story gets more kilig if its the guy that shows he's head over heels with the girl (although Nate already did that at the latter part of the story), perhaps just add in a little more kilig moves from Nate.